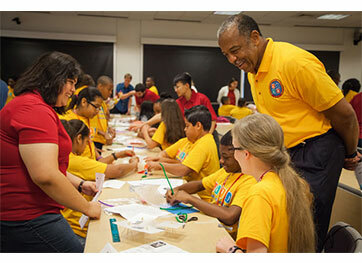 Bernard Harris looks on as campers do a hands-on STEM activity at the Bernard Harris Summer Science Camp. Scheduled for 9 a.m. to 12 p.m. Saturday, April 9, the event will host returning campers from the ExxonMobil Bernard Harris Summer Science Camp at UH and will be a preamble to this summer’s camp, which is celebrating its 17th year at UH. Attendees and their parents will participate in a brain-building activity and grow their knowledge about careers in STEM. While campers participate in a reverse-engineering challenge, parents will receive helpful information about college planning and financial aid. Dr. Bernard Harris Jr., the first African-American to walk in space and founder of the camp, will be in attendance. For the activity, students will be given a scenario of the fictitious Cougar Coffee Cup Company’s president specifically asking for Bernard Harris Science Camp students to design a mug in its annual “Build a Mighty Mug” competition. The students will be given a variety of recyclable, everyday items, such as aluminum foil, construction paper, remnant fabric, plastic wrap and wax paper, to use in designing and building the most effective coffee cup possible. Working in groups, they must test their cup, using a graduated cylinder, thermometer and stopwatch, to see how well it can keep coffee warm. At the end, the most effective cup will win the “Mighty Cougar Mug” prize. Dr. Bernard Harris Jr., the first African-American to walk in space, and 30-40 Houston-area middle schoolers who have an interest in science, technology, engineering and math. Best visuals 9:45 a.m. to 11:30 a.m.